Wing load (overloaded) 366 ? Summer of 1946 provided S.V.Ilyushin and P.O.Sukhoi with Governmental orders for four-engine jet bombers. Il-22 was ready first, turning out to be the first soviet-built jet bomber. Despite formal classification 'experimental', it was fully equipped and armed aircraft, ready for service. But actually design started in 1945, when A.M.Lyulka became practical work on first Soviet jet engine TR-1. Ilyushin team performed study of various engine installations, and finally came up with absolutely original scheme - four jet engines installed on isolated gondolas, podded under-in-front-of the wing on short pylons. This scheme was used first time in the world practice, now is quite common. All bombload was located inside: 2000kg normal and 2000kg in overloaded configuration. Il-22 fuselage had to be raised to allow loading of heavy bombs (2500kg or 3000kg). Barrel armament included fixed 23mm NS-23 cannon in the nose (150 rounds), tail installation Il-KU-3 (see photo) with one NS-23 (225 rounds) and dorsal remotely (electrically) controlled turret with pair of 20mm B-20E cannons (400 rounds per gun). Photoequipment was installed. Crew consisted of two pilots, navigator-bombardier, gunner-radio operator and tail gunner. Fist flight was performed by V.K.Kokkinaki on July 24, 1947, and 10 days later Il-22 appeared at Tushino Air Parade. second stage of trials ended in September 1947. next year team tried to improve takeoff performance. On February 7, 1948 V.K.Kokkinaki performed rocket-assisted takeoff with pair of SR-2 solid boosters (1500kg thrust each), marking first in the USSR RATO takeoff of heavy jet bomber. 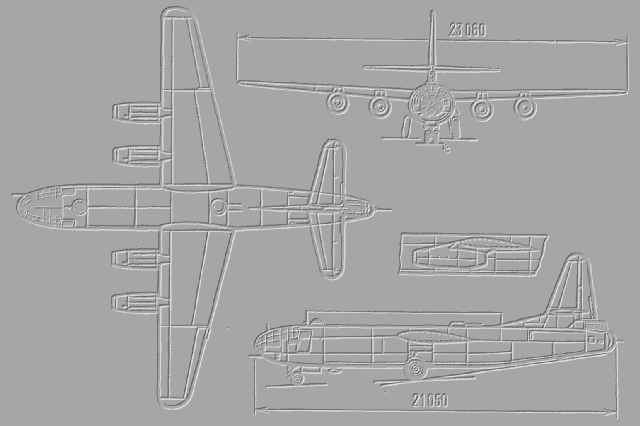 Careful study of the trial results and pilot's comments resulted in cancellation of related Il-24 project. Il-22 was installed in demonstration hall of the BNT. 'Aviation and Time',?°ТШРжШп Ш ТаХЬп?, ?1 1997 У.